This Major Development Plan has been developed in consultation between Gold Coast Airport Pty Ltd (GCAPL) and Southern Cross University (SCU). As the Airport Leasing Company, GCAPL is the proponent for the Major Development Plan. The Major Development plan has been prepared in accordance with the requirements of the Airports Act 1996 (Cth). The draft Major Development Plan was approved by the Federal Minister for Infrastructure and Regional Development, the Hon Warren Truss MP on 28 July 2015, following extensive consultation with the community and other key stakeholders. The draft has since been finalised, in consultation with the Federal Department of Infrastructure and Regional Development, and is now available as a final Major Development Plan. 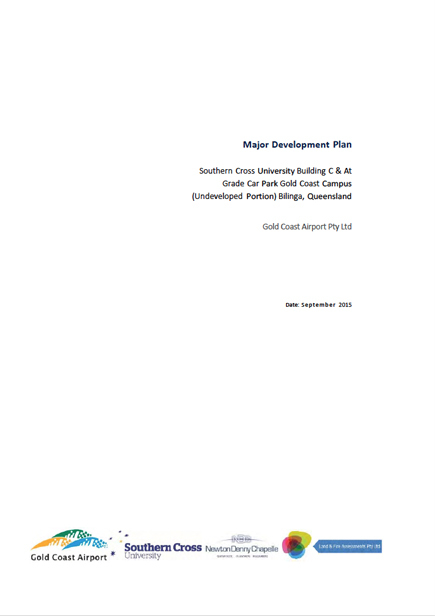 The final Major Development Plan details how SCU is proposing to construct Building C and an at-grade car park for 505 car spaces within the Gold Coast Airport grounds. The Campus already consists of two buildings, namely Building A and Building B. The proposed Building C is a six (6) storey building. This building will accommodate SCU College Headquarters, a lecture theatre, the Learning Centre/Personalised Learning Environment space, general purpose learning rooms, offices and presentation areas. In accordance with the requirements of the Airports Act 1996, GCAPL has made available a free copy of the approved Major Development Plan which can be downloaded using the links below for a period of 180 days. Copies can be viewed in the City of Gold Coast and Tweed Shire libraries.